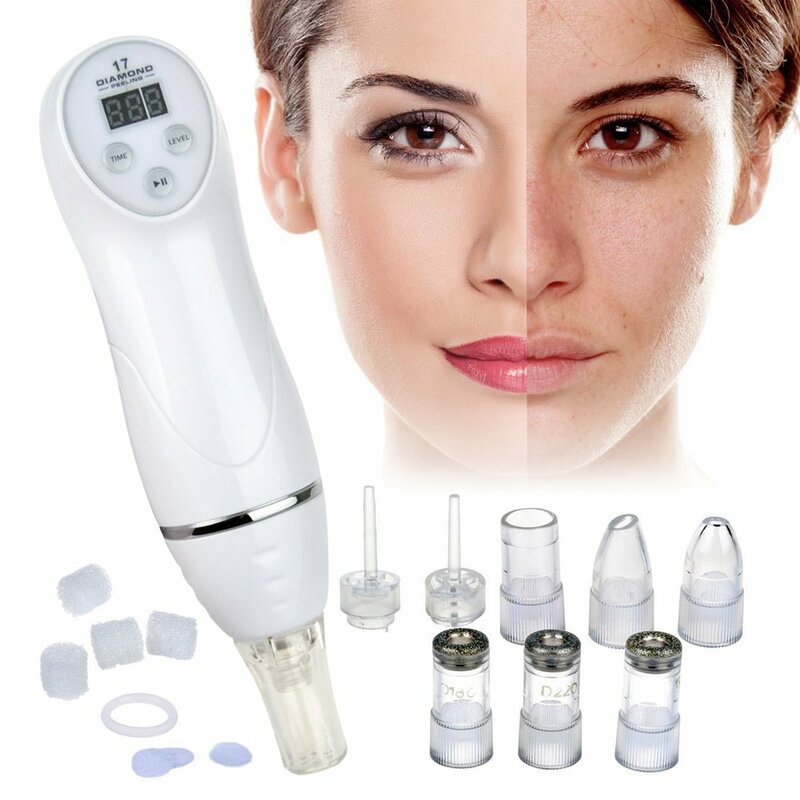 Some people purchase the UKLISS hoping that it’s an effective device for extracting blackheads. Does it work? In this UKLISS microdermabrasion pen review, we’ll tell you what previous buyers have experienced. Aside from being a blackhead remover, this pen-type device is also designed to get rid of dead skin cells through microdermabrasion. Is it effective? Just the same, we’ll give you some answers. As previously mentioned, the UKLISS is a 2-in-1 device. Here are its two primary functions. Because of its likeness to a pen, the UKLISS microdermabrasion device is sometimes referred to as a “pen” exfoliator. 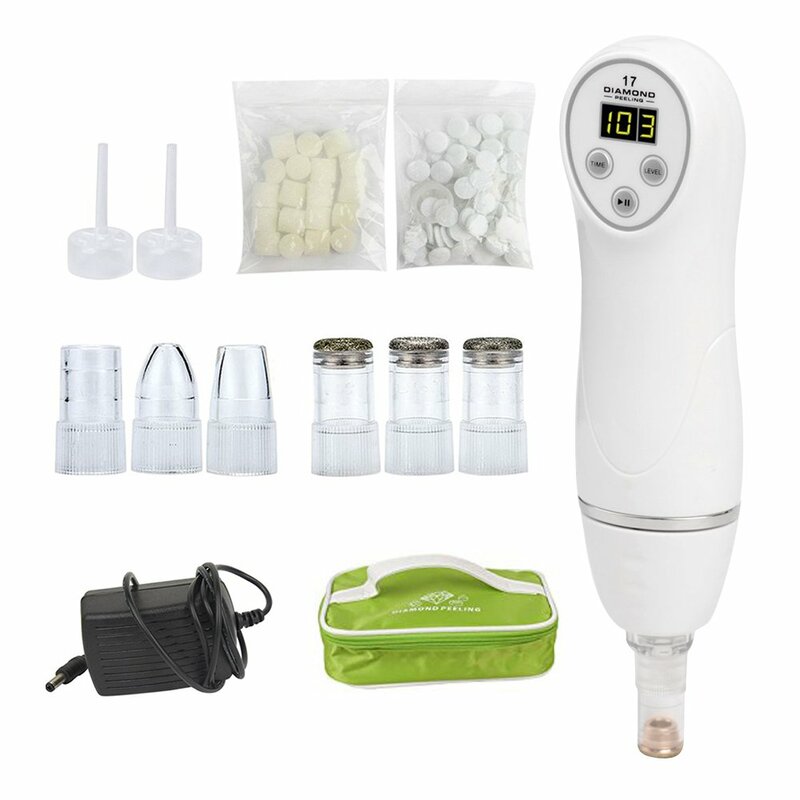 This personal microdermabrasion device has three diamond heads to choose from, with each head having a different degree of thickness or coarseness (D150, D180, and D220). Meaning, you can target different areas of your face and your body, just make sure to pick the right head. For instance, pick the finest tip if you intend to exfoliate sensitive areas of the face. For its second function, this UKLISS handheld acts as a blackhead remover. Aside from the diamond heads, the UKLISS comes with 3 suction heads whose openings (or holes) vary in size or shape. One head has a large circular hole that provides a strong suction to target the nose and the pores of the face. The other head has an elliptical hole that provides a quick pull-off mechanism that helps remove fine lines and promote blood circulation. The third head has a small round hole that provides a weak suction for parts of the body where the skin is thin. When you open your package, you should see the following contents: your microdermabrasion pen, 3 dermabrasion heads, 3 suction heads, 1 packet of cotton filters, 1 packet of filter sponges, 2 filter components, 1 power line, an instructions manual, and 1 yellow-green makeup or storage bag. Watch the video below to know what to expect. To complete this UKLISS microdermabrasion pen review, we went through comments and feedback posted on a popular online retailer as well as on the seller’s website, and then watched Youtube vlogs. How did the UKLISS microdermabrasion pen fare among consumers? Here’s what they have to say. As demonstrated by this beauty vlogger, the UKLISS peeling pen takes off dry and dead skin. After usage, the skin feels soft and smooth. It’s effective in removing blackheads. They get sucked out and get deposited in the suction head. One person said she has fewer breakouts because her pores are cleaner with the UKLISS microdermabrasion device. Is the suction powerful enough? This device has three settings as far as suction is concerned. While some described the suction and power to be “mediocre,” some wouldn’t want to use the highest setting because the lower settings are enough. Here are some pros and cons mentioned by users. It’s really light. At 0.77 kg, you can take it with you anywhere. Plus, the carry-in bag provided keeps every part in place, so there’s no fear of losing anything. The instructions included in the box are pretty much simple, clear, and straightforward. Unfortunately, not all users agree. Some of them still find that the instructions are not clear, like this beauty vlogger. Here are other brands that have a similar working mechanism. These handheld devices are designed to have other functions other than removing dead skin cells. They’re also intended for sucking out blackheads.